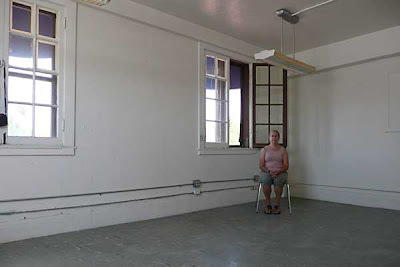 My studio space in Phoenix was a former dining room. It was about 130 square feet. Small, but adequate for my use, considering my studio time was pretty much limited to summer, when I was on break from teaching. 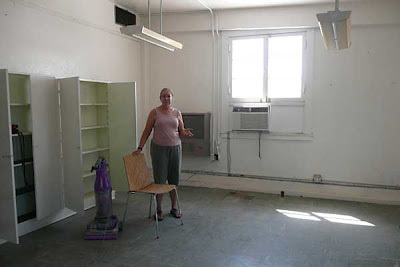 When we moved to Ajo, my space was upgraded to about 170 square feet, in what was supposed to be the master bedroom. I was happy to be in a more spacious studio. However, I've discovered over the past year that the more time you have to work, the more space you could use. I recently had the opportunity to rent a 350 square foot studio on the second floor on the Plaza. 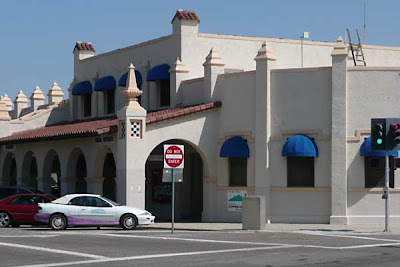 The blue awnings on the top floor, right side of the building are where the studio is located. You can see from the second photo that the windows are large. The third picture is of me with Barney (our vacuum cleaner), preparing to do some cleaning before moving in. Tomorrow, I hope to start moving my stuff. I have a lot. Much of it heavy or awkward. It's a very long and steep staircase. This is going to be very good exercise. I can't wait to get settled and get back to work!